The generations of transportation and development policy that treated people without cars as an afterthought, or elements to be actively discouraged, are simply another part of the weaponization of geography. It created a two-tiered transportation system that forced even many of those living in poverty to spend thousands of dollars to buy and maintain a car, or lose hours a day on increasingly disinvested transit services. Those who are physically unable to drive were left out no matter their financial situation. Returning to a transportation policy that prioritizes the lowest-cost, most accessible forms of transportation obviously won’t erase Chicago’s deep inequalities. But it’s an important part of the path to a better city. In a big-picture sense, reinvesting in public transit reverses a profound kind of privatization of the city’s streets, and sends the message that the public sphere—the resources that are truly available to everyone—can be just as good, and as dignified, as the resources only available to those who can pay. 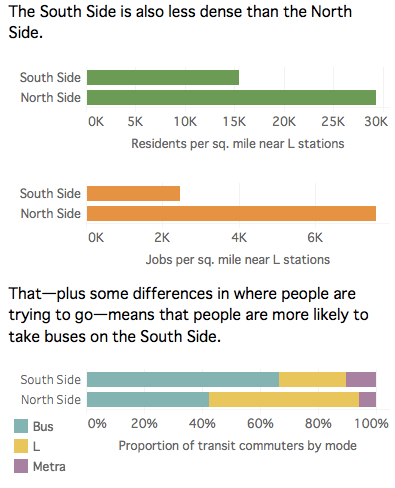 But more prosaically, a more accessible South Side, and a more accessible Chicago, means that when you want to go somewhere, you can do so faster, cheaper, and more comfortably. It means that more jobs, more grocery stores, and more parks and museums are a reasonable distance from your home. It means a more humane city, in ways big and small. Envisioning what accessibility might look like on the South Side is, hopefully, one modest step towards that kind of city. Next Next post: What is a left approach to housing in 2017?